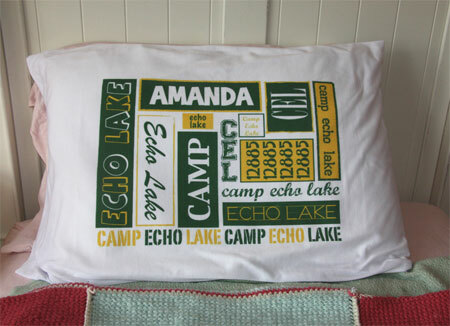 What child would not love these camp pillows or pillowcases! Choose to either get a small throw pillow with case or a large pillowcase for use with a standard-size pillow. You specify the child's name, camp name, camp nickname (or initials), the camp's zip code and the camp's colors. We�ll send you a free digital proof to approve before going to press. Small (with pillow insert): 12" x 18"
Large (no pillow insert - pillowcase only): 20" x 30"